☯ Luna Moonis ☯: First Attempt: Tribal Nails! Firstly, I apologise for the terrible photography. Secondly, excuse my shabby nail art skills today. It was my first attempt at tribal nails! I think it's ok for a first attempt! It turned out better than I thought it would anyway... I tried out galaxy nails and you innocent people don't deserve to see such a mess. I used Maybelliene Forever Strong nail polish in Ceramic Blue which my dad got me! Thanks dad :) I also used Barry M Nail Polish in Lemon, which was the most neon nail polish in my local Boots! And it's a huge Boots! I wouldn't believe neon would be so hard to find seeing as it's such a big trend right now; can anyone recommend a brand which does some really bright neon nail polishes? Also, I just wanted to let you know, I probably won't be posting for the next week! I'm going to Majorca tomorrow. Wooooo! I've been so excited for weeks! I don't know about the internet sitch at the hotel, if there is internet which there probably is, I'll be posting like an OOTD every day, haha! You did great for your first attempt!! Wow love the nails and I love your blog! 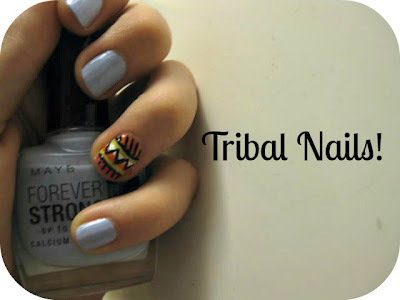 Oh wow I love these tribal nails, so creative and gorgeous! How did you do all the fine detailing? Great work!! Looking forward to reading lots more from you!